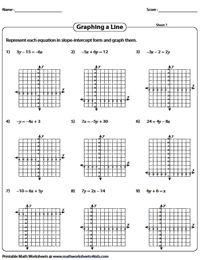 This extensive set of worksheets includes exercises like graphing linear equation by completing the function table, graph the line using slope and y-intercept, graphing horizontal and vertical lines and more. 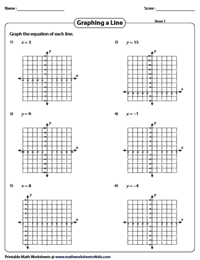 A series of MCQ worksheets requires students to choose the correct graphs based on the given linear equations and vice-versa. Free worksheets are also included. Substitute the values of x in the given equation to find the y- coordinates. Plot the x and y coordinates on the grid and complete the graph. 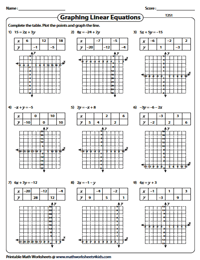 Each worksheet has nine problems graphing linear equation. Find the missing values of x and y and complete the tables. Plot the ordered pairs and graph the line accordingly. 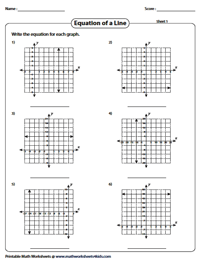 Download these worksheets for ample practice on plotting the graph. To graph a linear equation, first make a table of values. Assume your own values for x for all worksheets provided here. Substitute the x values of the equation to find the values of y. Complete the tables, plot the points, and graph the lines. Rewrite the given linear equation in slope-intercept form to find the slope and y-intercept and then graph the line accordingly. Graph the equation of the vertical line (x = k) or horizontal line (y = k) in this series of worksheets. Use the answer key to verify your responses. Free worksheet included. 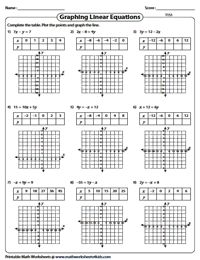 Look at the graph in this array of worksheets and write the equation of a horizontal (y = k) or vertical line (x = k). There are six problems in each worksheet. 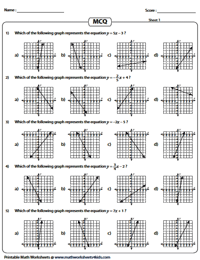 Identify the correct graph that represents the linear equation given in this batch of worksheets. Five MCQs are featured in each worksheet. 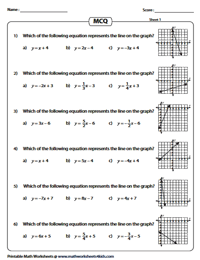 Read each graph provided in this set of worksheets and then pick the correct linear equation that best represents it. 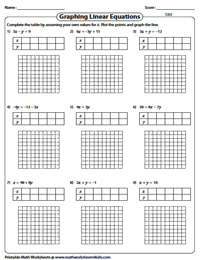 Download this set of worksheets to gain access to all our worksheets on this page.